It has been a while since we have updated our last "post Intense SEO Guide Part 4." Our team received numerous messages requesting to write more on the topic. Surely the guide is incomplete as our team was busy with "India Tour for Cyber Security " but now we are here with our new update to the series. Now without wasting any further of your time let me dive into the content you all readers awaited for. Now that we know about the long history of Google's search engine, let's learn about some powerful recitations for achieving top ranking in Google. Don't Miss: Intense SEO Guide by Ethical Hackers Club - Part 1. Always make sure your search engine maneuverings rely on great SEO practice. Never trust a single tactic to assure top ranking on Google. Understand The Three Supreme SEO Strategies. Since its modest origin in 1993 Google has been uniformly evolving. Eric Schmidt the former CEO of Google reported that Google considered over 200 factors to determine site ranking. Google assesses how many links are pointing to your site, how trust worthy are those linking sites, how many social mentions your brand has, how relevant is your page, how old is your site, and whats your site's load speed. And all these aren't complete. It may all seem impossible or very difficult to gain top ranking in in Google, but you can actually have an influence. Do Read: Intense SEO Guide by Ethical Hackers Club - Part 2. Google's algorithm can be complex but you don't need to be The Einstein to understand how it works. It all actually can be insanely simple if you focus on three principles. These three principles can help you determine why one site ranks higher than another or to understand what you need to get on top of your competitor. SEO Experts use advantage of the three principles "Authority, Trust & Relevance" to gain top ranking on Google. Previously used strategy authority, is still powerful and is accompanied by other two principles. Authority is your sites strength in your market. Authority is all about the number game. If your site has a million followers and backlinks on social media and your competitors have hundred, you're undoubtedly going to rank higher. Trust is googles core lookout since several years of its updates. Google works hard to keep untrustworthy & poor-quality sites out of search results to make room for high-quality and legit sites at the top. To rank high in Google Search make sure your site has quality content and has trust worthy backlinks. Google looks at the contextual relevance of the site and rewards relevant sites with a higher ranking. This plays an important role why the local business or niche sites rank higher than a Wikipedia article. 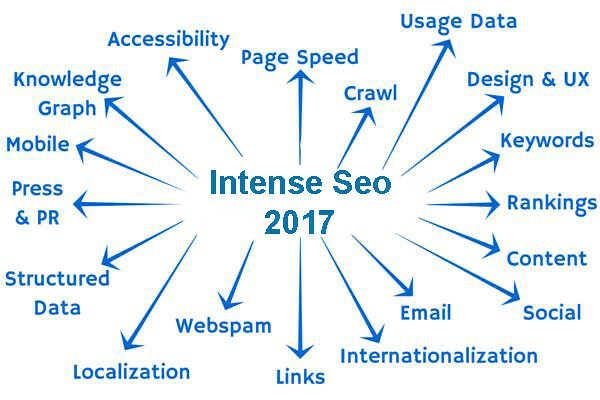 This can be used as an advantage while bulking up your site's content with relevant articles and use the on page SEO techniques to be described in the upcoming Intense SEO Guide Posts. You can rank higher with fewer links by focusing on building links from relevant sites. Increasing relevance is a powerful strategy and can lead to the higher ranking. I have seen people wondering to find out precise factors Google uses in their algorithm. Fortuitously, there are a handful of industry leaders who have figured it out and have been frequently publishing their efforts on the internet. These magazines like "shout me loud" can help you out in finding out the factors Google uses to rank sites. These studies are typically updated every year but the factors of SEO don't often change and so can be used to your advantage in knowing areas to be focused on. User Actions (Click-rates, time on site, Bounce-rate). Social Media & Google Plus Activity. If your competitors are more healthy with the above factors than they are surely ranking higher as compared to you. Combine this knowledge with the understanding of Google's recent updates to be covered in intense SEO Guide by Ethical Hackers Club, and you will be the master of what it takes to be on Googles top pages. The above factors are from "the search Metrics Google Ranking Factor" study released in 2015, which follows in depth knowledge to high ranking factors in Google. Google is working hard for its reputation of being a great search engine and to do so it releases significant updates to its algorithm. These changes can have an adverse impact on your business from the search engine point of view. To sharpen your SEO chops and make sure your site doesn't fall into Google's bad books, it is important to stay updated with Google's updates as they are released. Fortunately, almost every time a major update is released it is easily seen in publications of entire SEO community and is often discussed and confirmed by Google Staff. Staying informed about the Googles latest updates is essential for any SEO practitioner, be it a beginner or advanced level. Lets learn about Keyword Research which is the most important SEO factor. Including lots of unwanted keywords in your site is going to waste a large amount of your time and efforts to lead you towards the discovery of having no traffic towards the targeted or expected keywords. If you are lazy at your keyword's competitive investigation you are going to end up spending heaps of your time and effort at a keyword which is far too competitive to rank, even on the first page. These two snares are often the ultimate decider on how strong any SEO project is. In these post we will learn how to avoid these snares and the ways to find effective keywords. Lets start with understanding what a keyword is? If you are a complete newbie to the field of SEO, you may be wondering what a keyword is? A keyword is any expression you would like your site to rank for in Google's search results. A keyword can be a single word or can comprise of the combination of words. If you are trying to focus on single word keywords you are surely going to waste your time and effort as single word keywords are remarkably competitive, and are difficult to rank highly in the search results. Head-Term keywords: Keywords with one to two words, i.e. mystery books. Long-tail keywords: Keywords with three or more phrases, i.e. Sherlock Holmes A Study in Scarlet. Navigational keywords: Keywords used to mention a particular website or a brand like Facebook, Youtube or Ethical Hackers Club. Informational Keywords: Keywords used for the description of the particular topic. These are the keywords starting with "how to....?" or "What's the best....?" Targeting head term or navigation keywords for other brands are competitive and not worth wasting time or effort. While long-tail and informational keywords are great for most SEO projects. They may help in leading more customers. Stay Connected For Our Intense SEO Guide Part 6 To be A Master At SEO Projects.